12 Celebrity Singers, Top 12 Contestants, One Mega-Weekend! Bangalore, February 03, 2017: What happens when the best Bollywood Singers team up with the best musical talent of India? The result is not just a musical amalgamation but sheer magic! 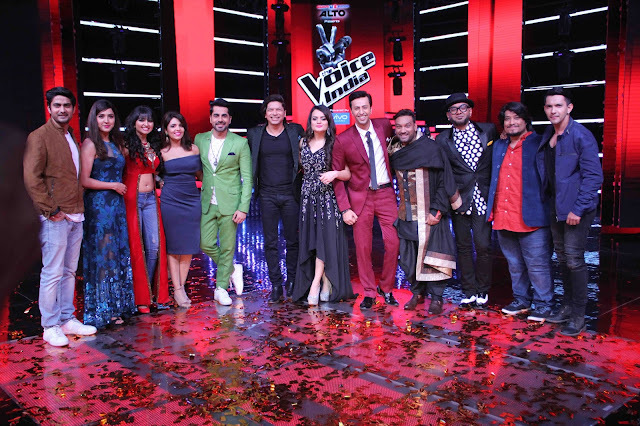 &TV’s The Voice India Season 2 is about to cast a musical spell as 12 Celebrity singers find their way to The Voice stage along with the Top 12 Contestants. For the very first time, the stage will witness such a mind-blowing opening to the LIVE round where the audience will now be in power to vote for their favourite contestants and take them closer to realizing their dreams. Don’t miss The Voice India Season 2’s Blockbuster LIVES starting this weekend, Saturday and Sunday at 9.00 pm only on &TV. Post a high voltage knockout round, where the coaches made tough choices and selected the 3 best contestants, respectively, from their own team, its time now to see the might of these singers individually. To test their mettle and to give the audience a taste of their vocal abilities, the Top 12 contestants have been paired with some of the best known singers from the industry. Top 3 from Team Shaan that includes Farhan Sabir and Neha Khankriyal from Delhi and Parakhjeet Singh from Punjab have been paired with Usman Mir, Akriti Kakkar and Ash King. While Niyam Kanungo (Bhopal), Mhd. Danish (Muzzafar Nagar) and Neha Bhanushali (Mumbai) from Team Neeti are ready to take the nations by storm with dynamic singers like Amit Mishra, Master Salim and Mohd. Irfan. Team Benny’s Divyansh Verma (Mansaur, MP), Rasika Borkar (Akola) and Sona Vakil (Mumbai) are paired with voices like Aditya Narayan, Aditi Singh Sharma and Divya Kumar. Lasttly, Sharayu Date (Pune), Yashodhan Rao Kadam (Ghaziabad) and Paras Mann (Jalandhar) from Team Salim are all set to put their best foot forward with an all-female celebrity paring of Bhoomi Trivedi, Jonita Gandhi and Richa Sharma. All 12 celebrity signers will be experience The Voice stage for the very first time. Not only have they shared tips and tricks with the contestants, but have also carefully chosen the duet they want to sing. Aditya Narayan says, "It feels great to be back on The Voice Season 2. I will be performing with Divyansh on Tatad Tatad from Ram-Leela. The performance is shaping up really well and that's my contribution to him in his musical journey and i want him to feel like a superstar when we perform. I am a great admirer of Benny Dayal and i am looking forward to see his reaction on our performance." Richa Sharma says, "I personally love The Voice India. The show has some amazing contestants who sing exceptional well. The best part of the show is the Coaches who represent the youth and i have some connection with all the four of them. I am really excited to perform with Paras who is from Salim's Team and i hope our performance is loved by everyone. This weekend, experience the power of 12 with some of the best musical renditions as the battle for the Live Round begins. Audience will now get the chance to vote for their favorite contestants, making this show more challenging than ever before! Watch the magic created by the Power of 12 on The Voice India Season 2 on Saturday and Sunday at 9:00 pm only on &TV! &TV is the flagship Hindi GEC amongst the ‘&’ bouquet of channels from Zee Entertainment Enterprises Limited (ZEEL), a global media and entertainment company staying true to the personification of the Ampersand, &TV signifies a conjunction of aspirations and rootedness which is synonymous with the spirit of New Age India. Through its content offering, the channel will bring together people and ideologies thus fostering cohesive viewing within Indian households. &TV will showcase a diverse and dynamic mix of relatable fiction, high voltage non-fiction, marquee events and blockbuster movies. The channel will be available across all Cable and DTH platforms.